Mainz might have slipped into the relegation play-off spot and been knocked out of the DFB Cup at the quarter-final stage by local rivals Eintracht Frankfurt in a miserable week, but coach Sandro Schwarz can count on at least one influential backer in the shape of Liverpool coach Jürgen Klopp. 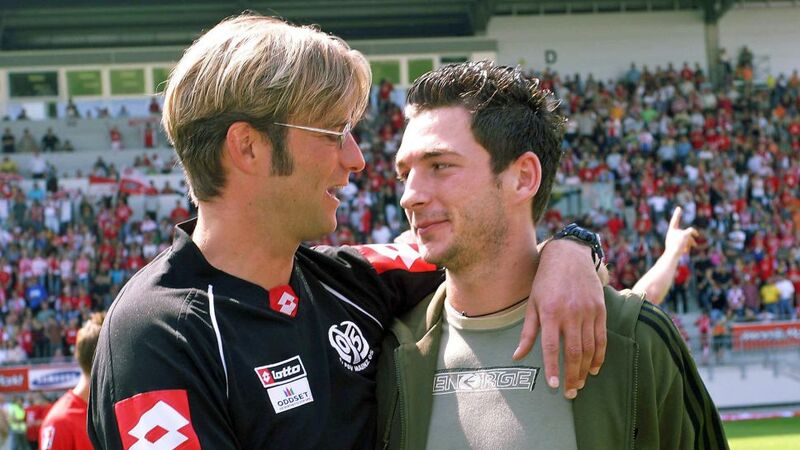 Schwarz and Klopp played 11 games alongside each other for the 05ers between 1997 and 2001, before Klopp took over the reins that same season. Schwarz then played 80 matches under the former Borussia Dortmund coach until 2004, achieving promotion to the top flight that year. Watch: Klopp scored some stunning goals during his time in the Bundesliga! "Sandro was my teammate for years," Klopp told kicker recently. "Then after I took charge of the club until we got promoted back to the Bundesliga, he was a really important player in my team. Sandro was always a fighter, a leader, someone who really lived for Mainz 05." Indeed, even back then Klopp had earmarked Schwarz, a holding midfielder, as a potential successor in the Mainz hotseat.